ln a fruit garden, you can grow all kinds of tree types a half standard apple is easy to pick from. If, when you were younger, you grew up with apple or pear trees in your garden, you will probably want to continue this tradition. There are shapes to suit even the smallest of gardens and the disease resistant varieties make the growing of such fruit much easier than ever before. 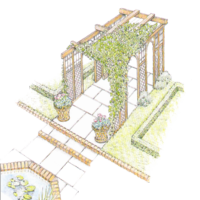 Trained trees for small gardens: Trained flat against a wall or trellis, fruit trees take up relatively little space. Stretching the branches out horizontally produces an espalier tree, while fanning them out from the main branch produces the fan. The 'step-over' - a form of cordon, or single-stemmed tree - is ideal along paths in the vegetable garden. You will need to prune most trees each year or they will lose their structured shape. Save time on pruning: If you don't want to prune every year and only have a small space to grow a fruit tree, plant trees grown on dwarfing rootstocks. Trees on a M27 rootstock will only reach 1.8 metres and M9 will reach2.4 metres. If you have a large lawn or meadow, buy a half standard or standard tree with a long trunk (1.2-1.5 metres). You can let them grow relatively freely and prune lightly but regularly in winter every two or three years. 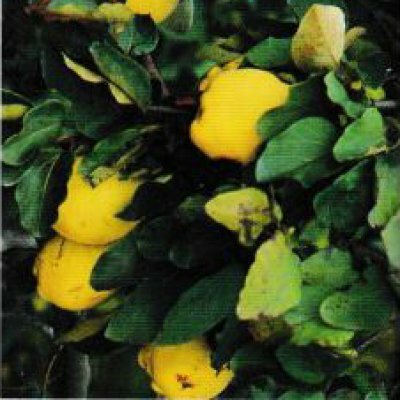 This is the only suitable method for quinces, which need only occasional light pruning. The art of hard pruning: This kind of pruning removes quite a lot of wood. 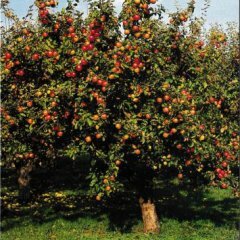 It is also known as three-budded pruning since it involves cutting apple and pear trees back to the third bud on fruit-bearing branches, and is recommended for artificially structured apple and pear trees such as cordons and fans. You need to take account of how vigorous the tree is before you prune it. If last year's growth was less than 5Ocm, then it is not particularly vigorous and will benefit from hard pruning. Prune in winter when the tree is dormant and cut back to three buds on each spur bearer, a lateral branch that grows on a framework or primary branch. If last year's growth was more than 50cm, then you are dealing with a vigorous tree that will be difficult to control with hard pruning. 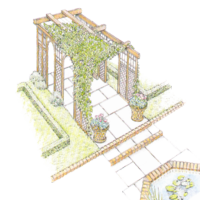 Bend the rules of three-budded pruning and don't cut back as hard, leaving four, five or six buds on each spur bearer. If trees have been neglected, the spur bearers are often multiple and complicated. Don't have any qualms about simplifying them by keeping only those closest to the framework branches. Natural pruning: Today, most commercial fruit growers don't use the hard-pruning method. They prefer to manage their trees more naturally an example you could easily follow. Allow the fruit-bearing branches to produce fruit naturally and then prune a few each year by cutting back to just above a young lateral branch that will replace them. This is known as renewal pruning. If the spur bearers have a lot of fruit buds, you can also prune to limit the amount of fruit produced. The quince revival: Favoured by the Victorians, the quince is a beautiful, modest tree, which is often used as a rootstock for pears. It provides light shade and produces magnificent flowers and aromatic, apple-like fruits used in making preserves.